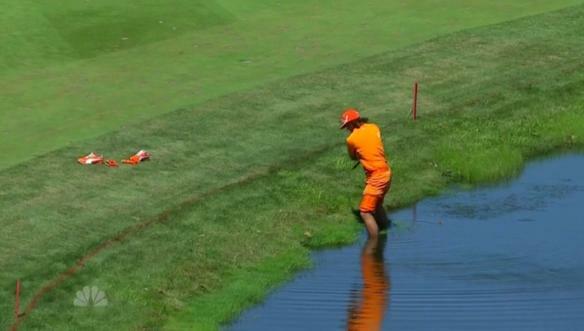 Guys were scrambling for the victory at Cog Hill today and also for their FedEx Cup lives. With only 30 guys getting through to the Tour Championship in two weeks the pressure was on. 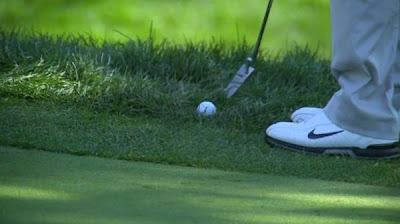 The greens were firm and bumpy and some guys like Paul Casey had to toe their putter to get up and down . Ryder Cup pick Rickie Fowler took his orange shoes off to hit a shot on #18 but couldn’t only salvage a bogey and shot himself out of a chance to play the Tour Championship. Ryan Moore got some bad breaks with a drive knocking off a spectator which led to a double bogey on the par 5 #11 he didn't get the victory but he'll be going to East Lake in two weeks. 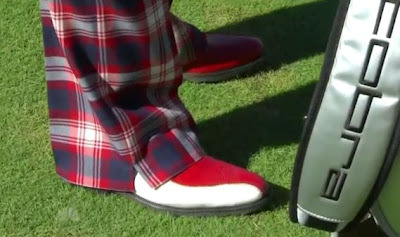 Ian Poulter had some great shoes but a triple on #11 killed his chances to advance to the Tour Championship as well. Guys like Kevin Na and KJ Choi made some good up and downs and some clutch putts down the stretch and got into the Tour Championship while big mouth Charlie Wi didn't. In the end Dustin Johnson prevailed for a karma victory after near misses at the PGA Championship and US Open. What's not to like about a young guy that hits it a mile and is so fun to watch. Good luck at East Lake Dustin!